The High Priestess card speaks of the inner mysteries. It speaks of secrets and the unknown. Hidden knowledge. 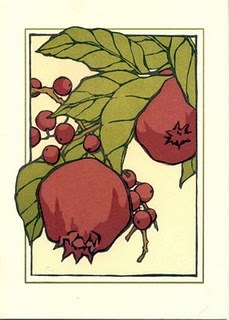 In the card, the HPS is surrounded by pomegranates. This is a fruit that, even today, still holds many – as yet unknown – healing properties. Properties that are only now starting to be discovered. It is still an inner mystery, hidden knowledge as-it-were. In the story of the garden of Eden in the bible, mention is made of the tree of knowledge of good and evil. It is unknown where the notion came from that the fruit of this tree was an apple, as there is compelling evidence to suggest that this was in fact more than likely a pomegranate. In which case it makes perfect sense that Eve would experience a realization of duality for the first time once she partook of this fruit of the High Priestess. In tarot it is the Magician and High Priestess who together first introduce duality into the journey that the Fool undertakes. She is the passive, feminine and the shadow, the opposite of the qualities of her counterpart the Magician. 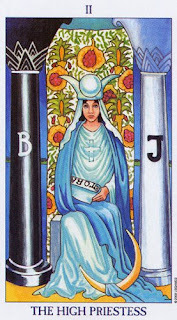 The pillars depicted in the HPS card, one white the other black, show duality clearly too. Duality is in fact one of the great mysteries that the HPS represents to us. The HPS worships the Goddess, of which the moon is a symbol. In a patriarchal society where focus has for a long time been on the God and therefore the masculine aspects of divinity, we do not yet fully understand the Goddess. She remains a mystery still – attainable only once we are able to eat of this symbolic fruit that holds mysterious properties so that we may cast aside the veil. This card tells us that it is time to examine what is going on inside our heads, in our thoughts. Things that aren’t out in the open, that are hidden from view. We can expect the unexpected, as is typical of the HPS, because all the tools we need are there, they are merely hidden from view. Explore the unobvious, and prepare to be surprised by what is revealed. To entice the mysteries out involves work. We might need to examine reoccurring patterns in our lives. We would need to try to discover why these cycles repeat themselves. Therein lies a great mystery too. Once we understand the need for the repeating patterns in our lives, we need to work towards bending it in our favour, in other words, work at gaining clarity and understanding that these reoccurring cycles are trying to teach us. Seek to unveil the inner mysteries is what the HPS whispers in our ear, if you dare… Yes, we may eat of her fruit to discover her mysteries, but we need to know that there is always a risk. We risk expulsion from our very own gardens of Eden, gardens of ignorance, predictability, order and uniformity, possibly even monotony. States of being that lack challenge, duality, chaos and… well, pretty much the knowledge of so-called good and evil, in other words the mysteries. The HPS furthermore warns that once the mind has been expanded it can not be returned to its original state, hence the expulsion from the garden of it’s former dwelling. Before Adam and Eve partook of the fruit of the tree of knowledge of duality (namely good and evil,) they knew eternal life only, no death. There was no duality, therefore there was no death. The risk therefore when seeking the mysteries of the Goddess that the HPS closely guards is the risk of death. We could live ‘forever in ignorance’ in our own gardens of Eden, thus ignorance, or we could expand our mind and thus experience death of what we have known before. The choice is ours to make, and it is not a light choice to make. Today this card asks us to examine whether we are ready to explore our own inner mysteries, despite what we may find there, the good and the bad. Or whether we would prefer not to ‘rock the boat’ as-it-were and thereby rather exist outside these mysteries. Do we really want to know? Are we ready to partake in communion with the HPS as we eat the forbidden fruit. We had best be sure that we are ready if we do. For once we do, we will never again be the same. And dare I say that those of us who have tasted this forbidden fruit would not want to go back, even if we could.